You are being lied to. It happens every time you walk into a supermarket, health food or vitamin store. Companies are selling "Healthy" products that have half a day's sodium in a single serving, "Lean" foods full of artery clogging fats and "Sugar Free" treats hiding chemicals that can send you to the emergency room. Rows of vitamins promise a restful nights sleep, more energy or relief from pain while delivering nothing more than pretty labels and empty promises. Here's a classic example. 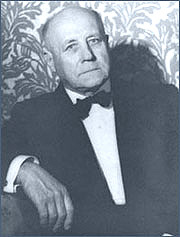 In 1919, Dr. William Frederick Koch started selling a drug called glyoxylide. He claimed it could cure, cancer, allergies, infection and "practically all human ills including... tuberculosis." He was able to keep selling it all the way through the 1940s, when the Food and Drug Administration finally tested it (in 1948) and they found is was nothing more than distilled water. How about something more current? 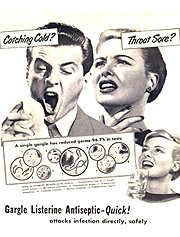 When Listerine was a new product in the 1920s, it was sold as a cure-all for sore throats and coughs. It took until 1975 before the Federal Trade Commission caught up with their lies and ordered Listerine to spend $10 million dollars on corrective advertising. Want something even more recent? 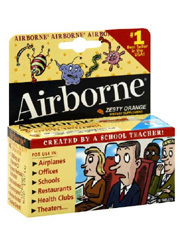 Airborne was marketed as a cold prevention medicine and then an immune system booster. It didn't do either. In March of 2008 Airborne settled a federal lawsuit and paid over $23 million in fines for false advertising. How do I know this stuff? Because it's my job. I spend hours every week working with my fellow trainers and researchers, reading trade journals and digging up clinical trials. Unfortunately, most people don't have that kind of time. That's why I'm going to give you a couple ways you can quickly determine if something is brilliant... or bull. Secret Number One: When buying food, the front of the box is for marketing. That item has to compete with thousands of other things in a typical supermarket, so the labels will promise you the world. What really matters is the nutrition label and the ingredient list. Ignore the pretty pictures on the front. Speaking of the ingredient list. If there are at least two things you can't pronounce on the ingredient list, it's probably not good for you. 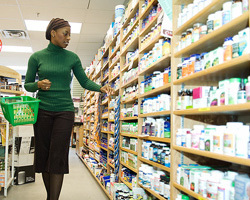 Secret Number Two: Look up your vitamins and supplements on a few choice websites before you purchase... and see what the skeptics say. My favorite is one called QuackWatch (quackwatch.org). Founded in 1969, Quackwatch is an "international network of people who are concerned about health-related frauds, myths, fads, fallacies, and misconduct." When I had questions about "Bio Identical" Hormones, Ionic Cleansing and Colloidal Minerals, QuackWatch was the site that helped me understand the schemes behind the sales pitches. As good as QuackWatch is, it doesn't cover everything. So I rely on these additional sites for unbiased information: Scam Busters (scambusters.org), National Council Against Health Fraud (ncahf.org), American Council on Science and Health (acsh.org) and The Skeptic's Dictionary (skepdic.com). Secret Number Three: Look for the money behind the ads. Every once in awhile I see commercials made by organizations that aren't promoting a particular brand, but rather a point of view. One example is a group called "Americans Against Food Taxes." It sounds like something I would support, after all, who wants taxes on food? I checked them out on a site called SourceWatch (sourcewatch.org). It turns out "Americans Against Food Taxes" is a Washington, D.C. lobbying firm, Goddard Claussen and organizations like the Coca-Cola company, PepsiCo, Dr. Pepper-Royal Crown Bottling, Canada Dry Bottling, 7-Eleven Convenience Stores, McDonalds, KFC, Pizza Hut, Taco Bell, Long John Silver's and A&W restaurants. Rather than being advocates for the common man, "Americans Against Food Taxes" are trying to stop a tax on sugar filled soft drinks that could be used to fund healthcare for the poor. I want to teach every person who's reading this how to cut through those lies and read the labels FAST. So we now offer a course called "Food Label Secrets." It's a series of short videos that are available FREE. Click Here for the Food Label Secrets video series. beginning any diet or exercise program. How Food Companies Create Addictive Food.